The Boxing Rings the Pro's use! PRO Boxing EQUIPMENT Rings, Buy or Rent boxing rings Direct @ PRO BOXING EQUIPMENT 100 % USA MADE With the precise dimensions, quality construction materials and accessories and exact accessory measurements you want at discounted prices! 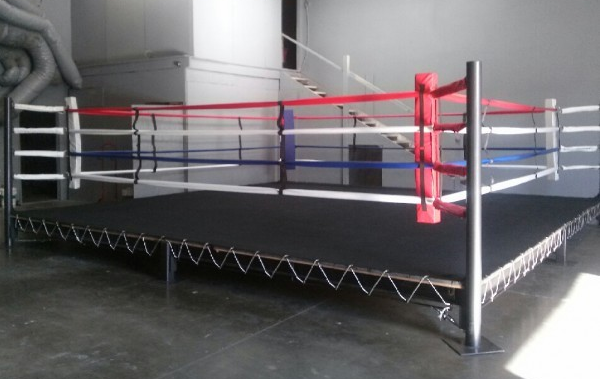 Our boxing ring selection includes: Competition Rings, Wrestling Rings, Ring Canvas Covers, Deluxe Floor Ring, Ring Padding, Ring Rope Spacers, Ring Ropes, Rope Clamp, Rope Covers, Rope Clamp Cover, Rope Retainer Ring, Corner Cushions, Ring Skirting, Apron Pad, Ring Stool, Turnbuckle, and Turnbuckle Cover deals. Custom Ring Dressing Available Upon Request. 100 % MADE IN THE USA ! Call 1-626-793-3945 to contact us for more information. 40000 points will be rewarded to you when you buy this item.